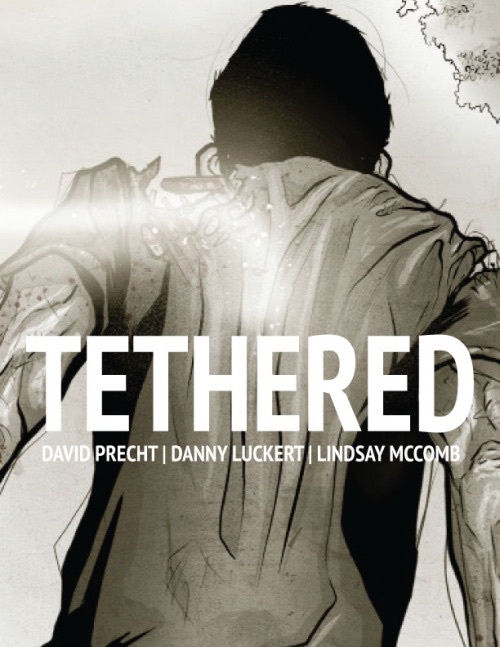 Tethered is a completely different take on the idea of zombies, and one met with the descriptive voice of David Faroz Precht and the killer artwork of Danny Luckert. Precht continues with strong writing throughout the story, even including some Hemingway quotes every now and then. He presents a tale that is just as much about mortality and living, from the perspective of the dead (makes sense when you read it), as it is about those trying to survive the zombie apocalypse. The artwork by Danny Luckert is impressive throughout the story, often times presented in black and white with various colors coming in every now and then, and full color pages coming in during flashback sequences. The artwork is kept highly detailed throughout and from one page to the next you can tell Luckert put his soul (get it?) into these pages. The first page to chapter three depicts a zombie that apparently passed while out on a run…must have something to do with that large hole in the back of his head. This scene showcases one of the tethered main characters looking down upon the carnage as another tethered soul continues to pester him — if only he’d just go away! With a combination of great writing and artwork alongside a creative concept this comic offers something you should be reading! Read it now at tetheredcomic.com in case the zombie apocalypse comes!